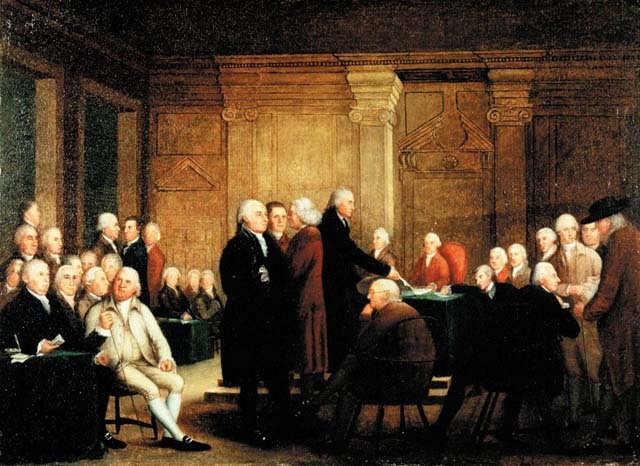 Meeting in Philadelphia as the Second Continental Congress, 12 colonies adopted a resolution of independence on July 2nd and the declaration on July 4th. New York abstained at first. Once it joined, Congress ordered the preparation on parchment of a formal, handwritten copy fo the declaration suitable for signing. Today, as we join family and friends in parks, swimming pools, and other gathering places around our country, the Declaration of Independence tugs at our heart strings. This is a time for reflection on the nation’s founding principles. For Rush and most other politicians of his generation that meant that there are inborn characteristics that are inalienable regardless of a person’s level of education, social and political station, or religious affiliation. The belief that everyone is entitled to fair treatment also has direct effects on the role of government. The Declaration of Independence rendered the protection of human rights an essential aspect of governance, but pragmatic domestic and foreign considerations counterbalanced those ideals with policy making trade offs. “We hold these truths to be self-evident, that all men are created equal, that they are endowed by their Creator with certain unalienable Rights, that among these are Life, Liberty and the pursuit of Happiness.” The nation’s maturation – be it through the ending of slavery, the enfranchisement of women, or the equal share of voting in congressional districts – has involved trying to fulfill the Declaration’s bold statements. The Declaration of Independence remains a symbol of national aspiration and an indictment for its shortcomings. As it did in the past, the Declaration of Independence can help us gain strength as a people.